Students had such a good time they decided to get a group tattoo! 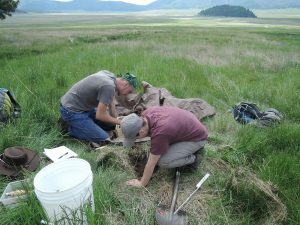 The Missouri State-Vallles Caldera Archaeological Field School returned for a second season from June 6th to July 7th, 2016. It was a continuation of the previous summer’s collaboration with the Valles Caldera National Preserve in Jemez Springs, New Mexico. 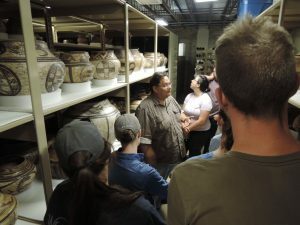 The field school provided students with an introduction to archaeological methods and Southwestern archaeology and cultures. They also met with an array of professional archaeologists to learn about their careers. The Valles Caldera National Preserve is a beautiful location to do fieldwork, and at nearly 9000 feet above sea level it stays cool when the rest of New Mexico is sweltering. Before it became public land in 2000, the Caldera had most recently been a ranch with a variety of owners stretching back to the 1800s. We began our field work by digging a series of shovel test pits in a grid around the old ranch headquarters. We were trying to find out how widely spread archaeological remains were so the Preserve could avoid putting a road through the site as they try to expand visitor access to the Preserve. We also did a pedestrian survey to find and record new sites on the lower slopes of one of the obsidian-covered mountains. During both the survey and excavation portions of the field school we found prehistoric stone tools and historic glass and metal artifacts. My favorite artifacts were a pile of Prince Albert tobacco tins from the 1950s found at what we determined had been a logging camp. We didn’t spend all our time working. 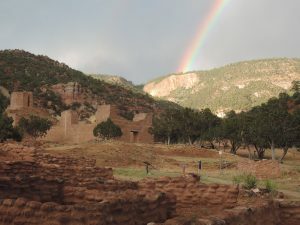 We had several fieldtrips to nearby cultural and historical sites, including Chaco Canyon, Los Alamos, Taos Pueblo, and museums in Santa Fe and Albuquerque. We even got to have a behind the scenes tour at the Museum of Indian Arts and Culture in Santa Fe.